Lionel Messi believes Barcelona need to improve defensively after Saturday's 1-1 draw with Athletic Bilbao saw the champions drop points for the third consecutive La Liga match. Messi was left on the bench for the first half, with Ernesto Valverde seemingly resting him ahead of Wednesday's Champions League trip to Tottenham. Without their talisman, Barca lacked creativity at Camp Nou and deservedly trailed 1-0 at the break thanks to Oscar De Marcos' goal. 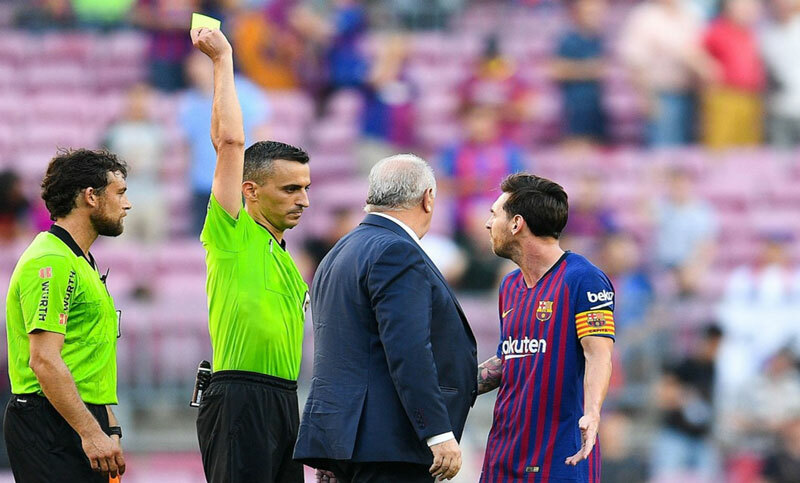 Messi was introduced early in the second period, hit the post and ultimately set up Munir El Haddadi for the late equaliser, but he was left unimpressed by Barca's back-line. When asked if Barca are being hampered by nerves, Messi said: "There is no anxiety. This is just the beginning [of the season]. "We only feel anger for the last two results. We did a good first half at Leganes and we lost. We create situations to win. "We are aware that we have to be stronger in defence and not concede goals in all matches." Barca have kept one clean sheet in their last five matches, a 4-0 drubbing of PSV in the Champions League, in which Messi hit a hat-trick. The draw at the Nou Camp continued a run of seven dropped points in the last three league games. Ernesto Valverde's side drew 2-2 with Girona last weekend, before being downed by bottom club Leganes in mid-week. The draw with Bilbao could now see Barcelona lose their place at the summit of the Spanish top flight and Valverde says his side have much to improve on. "A difficult week because we have not achieved the objectives," he stated. "But there are things that I think we can improve, above all, our offensive balance."